Dogs like Pit Bulls are muscular by nature. It’s one of their many appeals. Their strength and physique also make them superb working dogs, athletic canines and competition dogs. Like any type of athlete, a Pit Bull will only reach its physical potential with the right nutrition and exercise. If you want to bulk up your bully, choosing the best dog food for pit bulls to gain muscle is key. A healthy diet is vital for every dog, but even more so for working dogs, canine athletes and dog breeds that are naturally athletic. Pit Bulls are one of the most physical fit and muscular canines on the planet by nature. Appropriate, breed-specific diet ensures that a Pit BUlls' body gets all key nutrients required to grow, prevent bone diseases, maintain energy and perform all functions. The best dog food for Pit Bulls and well structured diet will give your bully an adequate amount of calories without causing him to become obese or malnourished. * Click on the best dog food for Pit Bulls for more information and prices, or scroll down below for more details. How to pick the best dog food for Pit Bulls? The below best dog foods for Pit Bulls have been formulated specifically for muscle growth. However, before your pick a new diet for your bully, discuss it with a professional. Consulting with your vet about the best dog food for pit bulls to gain muscle is a must. Your veterinarian, or canine nutritionist, should always be the first source of information on how to feed your bully if you want him to be more muscular and athletic looking. These conditions (and many more) can be either prevented or helped with the proper diet by feeding certain Pit Bull appropriate foods and avoiding many other brands. In fact, studies show that diet is the primary cause in many body, skeletal and other related health problems in dogs. Your vet knows your bully's medical history and will be able to advise accordingly. The vet can tell you not only what the best dog food for Pit Bulls are, but specifically your bully based on his age, weight, activity and any medical conditions that your dog may have. We've previously published a guide on how to bulk up a Pit Bull healthfully if you're looking for more tips and advice on how to make your bully gain weight and lean muscle. Once you've done some research, you can discuss the best dog food for pit bulls to gain muscle with your vet and decide which would be the right diet for your canine athlete. What is the Best Dog Food for Pit Bulls to Gain Muscle and Weight? Is your bully looking a little more Bruce Banner than Incredible Hulk? Muscle Bully is a mass gainer and nutritional supplement that will help your dog build the healthy weight that he needs to look and feel in top condition. Bully owners across the USA love this product for dogs that are underweight, convalescing, nursing pups or poor gainers. Muscle Bully Gains is packed full of premium quality ingredients and essential nutrients. It doesn’t contain salt, sugar or fillers either, making it a healthier option than some other best dog food for Pit Bulls to gain muscle. It’s less costly than veterinary diets and you’ll see the results quickly. This product contains the optimum balance of crude proteins, fats and amino acids for muscle growth and recovery from exercise. The nutritional fats condition the skin and add shine to your bully’s coat. Very occasionally an owner will report that their dog just won’t eat Muscle Bully Gains for Bullies. Like any product though, it can’t appeal to every bully’s taste. Muscle Bully Gains should be used as a daily supplement. It comes in powder form and includes a scoop for accurate measuring. It’s important to follow the easy to use feeding guide and to weigh and record results as instructed. Each bag will last for 1-2 months, depending on the size of your dog. If you’re looking for a reliable and cost effective supplement that boosts both muscle development and health then Muscle Bully Gains should be on your hit list. Gorilla Max is a powerful muscle building and health supplement by the dog vitamin makers, Bully Max. Whether you own a Pit Bull or a Poodle, this product will give you great results. 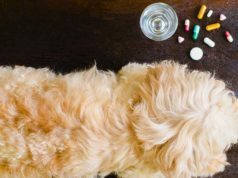 Veterinary approved and meeting stringent FDA and AFFCO standards, it’s not surprising that working dog owners and champion show dog owners rate this supplement highly. For dogs over the age of 12 weeks, Gorilla Max is designed to not only add mass but also provide an impressive range of health benefits. With 20g of protein per serving, owners report seeing muscle growth and improved condition in 2-3 weeks. Described by the manufacturers as containing ‘revolutionary nutrients’, Gorilla Max brings health benefits such as improvements in strength, immunity, digestion and overall vitality. Whilst the majority of dog owners rate this best dog food for Pit Bulls to gain muscle highly, not everyone agrees. The biggest complaint is the claim that GORILLA MAX Protein Muscle Supplement for Dogs contains up to 30 servings. Customers have contested this, stating that each bag is only a quarter full. A few customers have reported that their dog doesn’t like the taste and also that the product has caused diarrhea. For dog owners that are looking for a premium, industry approved supplement for muscle growth and health then this product is a strong contender. If you’re looking for value for money though this might not be your first choice. Bully Max High Performance is the ideal performance food for working dog breeds. This best dog food for Pit Bulls to gain muscle claims to be a super premium dog food and dog owners agree. It is the only performance food on the market to receive a 5-star rating from the trusted third party review site, dogfoodadvisor.com. Made with 30% protein and 20% fat, this high-protein, high-calorie food is designed to keep the most active dogs in top condition. Bully Max is made from natural ingredients including chicken meal – a meat concentrate that packs in almost 300% more protein than fresh chicken meat. It’s the only meat-based food of its kind. With no added corn, wheat or soy, owners have found that it can greatly reduce the symptoms of dog with allergies. There’s a whopping 535 calories per portion too, making Bully Max High Performance Super Premium Dog Food the ideal food for maintaining your working bully’s weight. Dog owners have reported improvements in muscle definition, weight gain, coat condition and stamina in just 2 weeks of use. 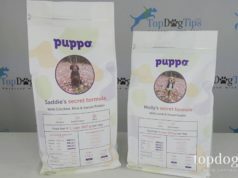 A few owners have been disappointed that there’s no large bag option and therefore no savings to be made, making it an expensive feeding regime. Bully Max is one of the most impressive premium performance foods on the market, if not the most impressive. It has the backing of customers in its ability to give your bully the nourishment that it needs. If you’re not looking for bulk bay value then Bully Max is certainly worth a try for dogs that work hard or play hard. Elite K9 Nutrition has produced a real hit with their Maximum Bully Chicken and Pork Dog Food. Bully owners love the carefully selected natural ingredients that deliver great muscle definition and vitality in a matter of weeks. Bullies think it’s tasty too. Maximum Bully is designed to provide the balanced diet that your bully needs for muscle development and overall health at every stage of life. It contains chicken meal and pork meal, providing multiple sources of protein (33%), fat (22%), amino acids and nutrients. Nupro 2000 – a yeast protein, supports optimum muscle growth and health. Your bully’s digestive health is catered for too, with the addition of pumpkin, probiotic, cranberry and oatmeal. Reviews of this product reveal that bully owners have seen an increase in their dog’s energy levels as well as increased muscle definition, allowing them to work harder for longer during the day. There have also been reports of significant improvements in coat and skin condition when other hypoallergenic formulas have failed. Based upon customer reviews of Maximum Bully Chicken and Pork Dog Food, there isn’t much to grumble about with this product. A very small number of owners have found that this feeding regime has caused their bully to have diarrhea, probably due to an intolerance of the high protein and fat content. Maximum Bully offers a great feeding regime for owners that want to enhance their bully’s natural muscle growth and energy levels. With carefully selected natural ingredients, it provides a balanced diet that will keep your bully in prime condition throughout his life. Muscle Builder and Performance for Dogs is a powerhouse of ingredients for optimal muscle growth, recovery and all round condition. This natural formula from MVP K9 Supplements is vet approved and has been field tested by champions with excellent results including increased performance, focus and lower stress levels. This supplement contains high quality whey protein isolate, amino acids, creatine and colostrums to promote muscle development, performance and recovery. The natural nutrient, Dimethylglycine, or DMG, further supports muscle metabolism, muscle efficiency and reduces lactic acid build up for speedy recovery. DMG is also known to boost the immune system and fight off cancerous fatty tumors. 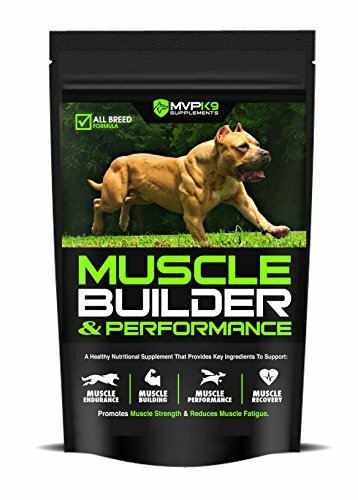 Customer reviews of MVP K9 Supplements Muscle Builder and Performance for Dogs back up the manufacturer’s claims of it being a powerful supplement. The benefits observed range from increased strength, stamina and recovery to lean definition and a shiny coat. A small minority of customers report that the product made no difference to their bully despite appropriate exercise and feeding. Muscle Builder and Performance for Dogs is the protein shake of the canine world. Used in conjunction with a suitable diet and sufficient exercise, this supplement will support your bully to meet his potential before, during and after competition or a day in the field.